Best of Times Magazine 2006 Edition: SOLD OUT! The Best of the Times Magazine- 2006 Edition is now SOLD OUT! Note that we will NOT be re-publishing this book. Thank you to everyone who supported this great local history project! In March 1999, a publication was launched for the people of Walkerville, a 19th century model town founded by Hiram Walker of Canadian Club whisky fame, that had amalgamated with Windsor in 1935. The Walkerville Times, a local history-focused paper, quickly became a must read for Walkerville residents. Due to requests for stories about the rest of this region’s fascinating past – once known as the Border Cities, The Walkerville Times evolved into The Times Magazine two years later. A compilation of hundreds of stories and over 1,000 photos of Windsor and area’s rich history from the first 46 issues, was released as “Best of The Times Magazine” in November of 2004. All 3000 copies were gone in a year, so due to popular demand, we give you “Best of The Times Magazine 2006” which includes stories and photos from all 56 issues. Travel back in time to the rowdy days of rum running, the revolutionary beginnings of Canada’s auto industry, spend lazy summer days swimming at Ford Bathing Beach, ride the steamer Columbia and Ste-Claire to Bob-Lo island, explore ghost stories and cursed islands, return to the North Pole at Hudson’s, exit the US with slaves via the Underground Railroad, say goodbye to those brave boys heading off to war – and so much more! Best of The Times Magazine has something for anyone interested in Windsor and area’s history – and for those who have lived it! Without a doubt, anyone from the Border Cities who reads Best of The Times Magazine will recognize a familiar name or face – maybe even their own! 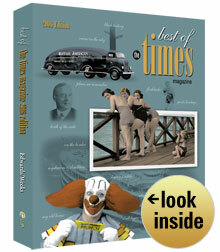 “Best of The Times, 2006 edition, is an enlarged and updated version of the 2004 coffee-table book published by their company, Walkerville Publishing. All 3,000 copies of the first edition sold out within a year. Walkerville Publishing would like to acknowledge the following Legacy Sponsors: Anchor Lamina Inc.; City of Windsor; University of Windsor; RJ Cyr Company Ltd; Windsor Memorial Gardens.